Scott Manhardt established as one of the key officiating figures in Brave Combat Federation. The former F-15 Crew Chief at the United States Air Force, is making his presence felt at the MMA world with precise judgments and controlling the fight environment. IMMAF official, Scott Manhardt has established as one of the most respected faces of discipline in Asia. The veteran referee had officiated bouts at multiple promotions around the world including Brave Combat Federation, IMMAF events, Superkombat, RXF and many more. What is your experience getting into the cage for the very first time? How do you stay calm in the cage? I had done much officiating in grappling and Jiu-Jitsu before I started my career as an MMA referee. I was also prepared by refereeing sparring matches at the gym. Obviously, I was a bit nervous during my first time in the cage. But I have gained enough experience and exposure to be ready for the situation. Once the fight began, I felt comfortable. Looks can be deceiving, haha. Joking aside, it’s more like concentration than calmness. I try to stay focused and relaxed. What do you look for in a bout? Is it the same for every fight and fighter? A fighters eyes tell you a lot, but the main thing in deciding to stop the bout is if the fighter is still trying. When he is unable or unwilling to keep trying, the fight can be stopped. In general, I treat most fights the same. I might give a little more time to a grizzled veteran than a young fighter making his or her debut. There had been much pressure upon the officials as the sport of MMA improves. Do you ever feel that, or are you in a different state of mind? I will be in my zone throughout the fight. I had been a part of large events with more than 10,000 people around cheering for their favourite fighter. I can honestly state that I haven’t even noticed the crowd. Of course during the finals of a tournament, there is a heightened sense of importance, but our task always stays the same. Even if it is a title fight, the criteria remains the same. We give the fighters every chance possible but will never sacrifice safety for sake of their pride. How do you deal with criticisms. Do you ever take it personal? Never. Partially, criticism often comes from ignorance. That might sound harsh, but the vast majority of fighters, coaches and trainers don’t know the rules and protocols. Being said that, no one should be above reproach and I’m always willing to have a respectful conversation to hear them out and explain why I may have made a decision. What are your opinions in letting the fighter to get to the end of the round? This was discussed in the IMMAF certification course. Even if just seconds are left to finish the round, we must stop the fight based on the criteria. The criteria of officiating safeguards the health and interests of the fighter. It is better to fight another day than to risk your career or to suffer a lifelong injury. What system would you like to see in MMA to be implemented? And why? How was it like working with Brave Combat Federation? What do you think about the role of Bahrain? I really enjoy working with Brave. They treat everyone great. From the fighters, to the officials, to the staff. From a regulatory perspective, there is a real drive from the top leadership to do things the right way. Until last year, when thinking about MMA in the Middle East, it was all about UAE. Not anymore. 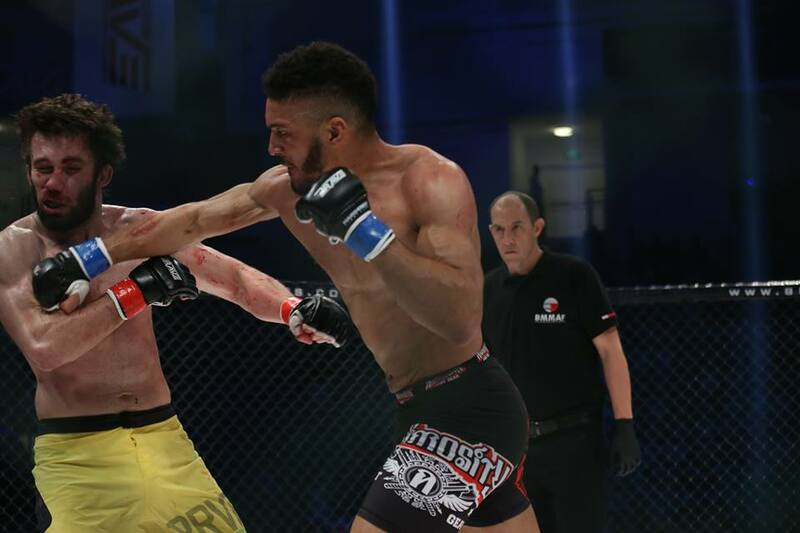 Bahrain is letting the world know that they can be a major player in MMA. Hosting the IMMAF World Championships is another demonstration of that. You are an avid traveler. What fills your life when you are not officiating? What is your message for potential officials? Get involved! It’s important to train in the sport. Especially the grappling and submissions. If you can’t distinguish between headlock and a choke, you really shouldn’t be in there. Promoters always need volunteers to help out around the cage. Time keepers, runners, whatever. It’s a great way to get started and meet others and ask questions. When you are ready, go to preferably an IMMAF certification seminar. IMMAF has, in my opinion, the best system for officials progression.